There are few places in New York City where one can eat lunch daily while enjoying a concert from a jazz great--all for free. In fact, as far as we know, Bryant Park is the only place that offers such a program. Join us for 22 weeks of al fresco concerts by New York's finest pianists, performing ragtime, stride, and jazz. Take a look at the lineup of world-class pianists that will take residency at our Bryant Park Piano--you'll recognize names from various Halls of Fame, and from previous summers at the park. Singalongs return for their third year in the park, and will start after Broadway in Bryant Park performances starting July 7. Join us for two hours of Broadway standards, played live. You don't have to know every word--we provide the music and lyrics, and you provide the vocals. 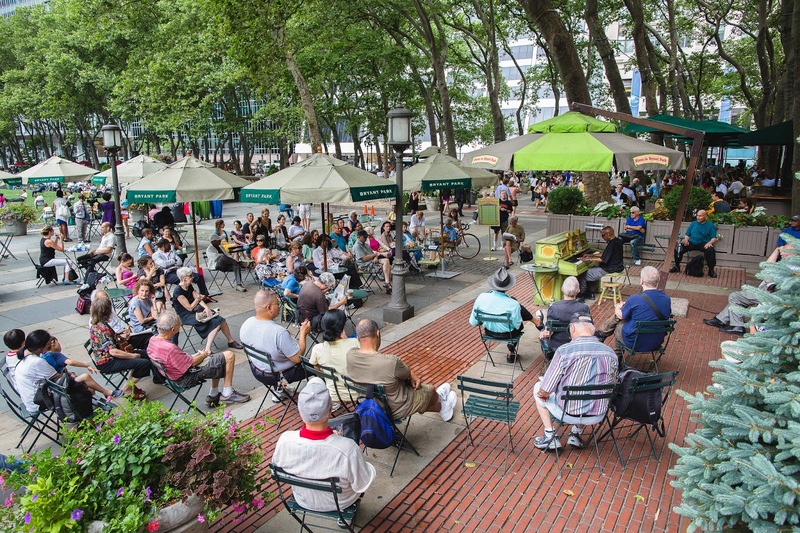 Piano in Bryant Park is produced in partnership with the Local 802 of the American Federation of Musicians, Sam Ash Music Stores, Jazz Center of New York, and Music Performance Trust Fund. Piano takes over the Upper Terrace.